Ahhh, wedding season. I used to read the engagement and wedding section and see names that I recognized, perhaps an older sibling to one of my children's friends. This summer we turn a corner. One of Nic's friends is engaged to get married next summer, and one of my friends daughters is getting married. What? Didn't I just cater her high school graduation? How can this be possible? It's like dominoes, they all start to go once someone jumps. She is a nice girl, and I read all about her engagement on their wedding page and my heart swelled with happiness that young love is alive and well. I also got married right out of college, and the naysayers be damned. We are celebrating 25 years this fall. 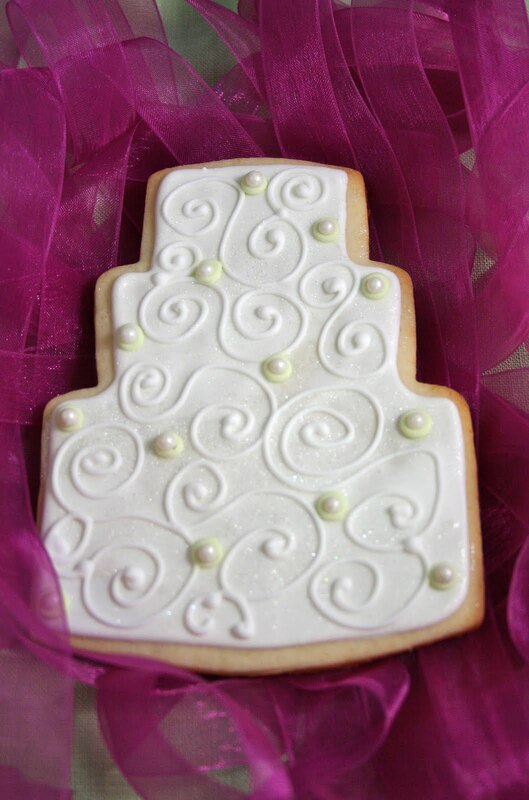 I made cookies for the hotel baskets, and we decided on wedding cakes. I have a few different wedding cake cutters, but I really wanted a particular one. Perfect time to buy! I ordered it from ecrandal and let me tell you, the cutter is gorgeous, the service was top notch and when she sent me an email that her husband was "making the cutters today" I almost fell out of my chair. Put that on my list of dream jobs. This is the ultimate family run business, if your cookie crazy like me, I guess. Even the packaging was perfect. So here is a sampling of the cookies, and the lighting is terrible at the end, I blew a bulb in my brand new light box. Seriously? This photography thing is wearing me out! 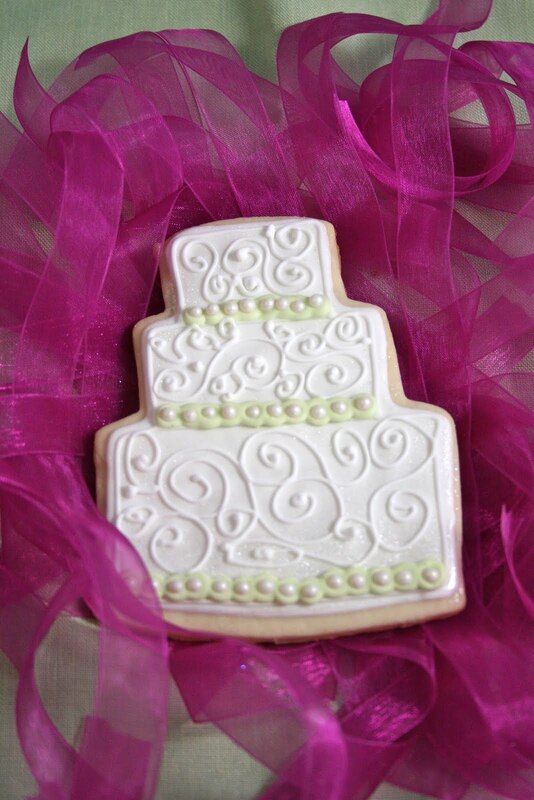 The wedding colors are celery green and a bright purple/pink. So I decided to do the cookies mostly white, lots of sparkle and a few accents of pale green. I found the perfect ribbon color to accent the bags. Once I started with the piping bag, I just couldn't stop. I have to admit, these are my favorite. I love the piping and the sparkle. Thankfully she didn't ask for all 60 the same...at least not that I recall! I loved doing different things to them! So have a blessed wedding Miss Megan, and many years of happiness! So tonight is the going away party for a friend I made back when my daughter transferred in the 4th grade. We were instant friends. For many reasons. First off, everyone thinks we're sisters, which we think is hilarious. It's because we both have very dark brown eyes and amazingly fine hair, and I don't mean fine, like really great, I mean fine, like feathers. She is also one of the most brutally honest people I know, shoot from the hip comedienne and would do anything you needed. We became friends through volleyball. Her daughter is tall, like her, and plays front row, mine is short, like me, and plays back row. We have traveled to many a venue, ragged on about terrible coaching, and stayed up late having many cocktails. 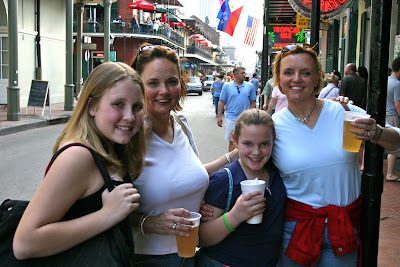 This is us in the French Quarter after a day of watching volleyball. 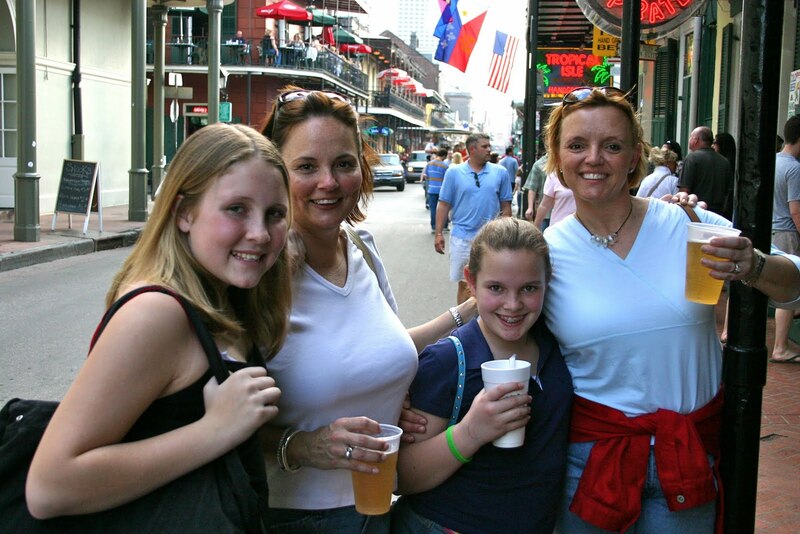 Our beautiful daughters will cringe at this 5th grade shot! Trust me when I say they outgrew the awkward stage nicely. This is the girls at graduation on either end of the group! One of our craziest memories is the White Trash party we and a few other couples (all having had a temporary brain lapse) put in an auction. The bidding went WAAAY up and we threw a party at my house no one is likely to forget. We didn't miss a detail from our clothes to the decor to the food. Trust me when I say you never want to host this party. People fall into character and forget where they are. And let's just say this party alone will keep me out of any political race. PC is wasn't. She is moving to Nashville next week. (Yes, we are also moving to Nashville, please do not ask me when.) She has more urgency than I to get settled. She has one headed off to college, but she has another who will be a sophomore in a new high school. And her husband has been working full weeks in Nashville for a few months now. I have no sense of urgency. I want to relax this summer and enjoy my kids last summer together. When they head off to school in August, I'll put the sign out. It'll be a lot easier to keep clean. When I got the evite for the partyI knew I would have to whip up some cookie goodness. I have brought her rejects over the years, and tonight she gets her very own! I bought the guitar cookie cutter thinking of my son the musician, but decided what a perfect cutter for a family moving to Nashville, home of country music. (Yes, I know a guitar has 6 strings and these look like a ukelele, but I could not fit 6 strings...) I searched the web and found some cute ideas, I liked the "Nashville or Bust" idea, and I saw a lot that said "We'll miss you". But I won't miss her, since we are moving to Nashville sometime soon. So between house hunting and actually getting there, I won't have time to miss her. We will pick up where we left off here in Germantown. And how lucky we both are to move to a new city with old friends! This post is for Darlene, Mary and Lori. Breast cancer has struck each of them. Darlene is my mother-in-law and she has been cancer free for 17 years. Hooray! Mary is married to my brother EJ, she has been cancer free for about 10 years. Hooray! And then Lori. My big sister, business partner, friend and nemesis. My mom was afraid we would never be friends. She is just 6 years older, so I was never old enough to be included in any of her cool plans. I always wanted to be her. She had long brown hair, I had scraggly blonde, she had boyfriends and I had Barbies. She got her license and I got a 10 speed. I was always 6 years behind her. Somewhere around my senior year of high school when she was out of college, we became friends. Inseparable friends. Now, she lives in L.A. and I live in Memphis. She has cancer, and I don't. So I am making cookies in honor of Lori and all women who are fighting. This is a guest post for Frosting For the Cause and I hope you will check it frequently. A baker/blogger like me posts there daily to tell about courageous women and make donations for the cause! When Lori finally decided to share her diagnosis with the family, her email subject was "Water skiing saved my life." She is an amazing water skier and you will see her and her hubby Scott zipping all over Lake Arrowhead in the wee hours of the morning before the amateurs take to the water. She had a massive wipe out and called me to tell me how bruised up she was. I assured her that she would be fine, but she went to the doctor anyway. Whew! Her doctor told her to keep an eye on the bruising and tenderness and come back if it didn't heal in a timely manner. The bruises disappeared, but the tenderness in one breast did not. She went back and had an ultrasound. The tumor they found would never had been found on a mammogram. She was very lucky. So after surgery and treatment we wait for the follow ups and the magic words of cancer free. When I was deciding what to bake to honor her, I had a dilemma. I am all about sugar cookies, but the new Cancer Lifestyle that Lori has adopted excludes white sugar. 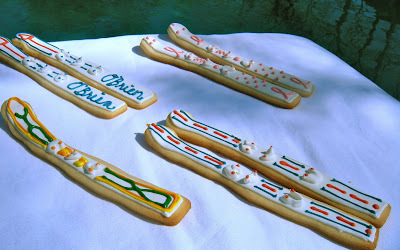 So I whipped up some kooky water ski cookies at home and shot a few photos. But I knew these delicate cookies couldn't make the trip to California. When I went to California for her surgery, I made "no white sugar" cupcakes specifically for the Frosting for The Cause. 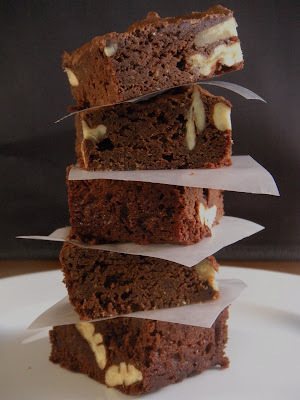 They are adapted from a recipe from Mäni's Bakery cookbook called Sweet and Natural Baking. The recipe shows a gorgeous cake, but cupcakes are more fun. These cupcakes really need to be stored in the fridge, and I wasn't sure where I could take sweets when I was in California, so these were for Lori to enjoy. I decided when I returned home I would make up a batch of ribbon awareness cookies to give to a local breast clinic. I have a friend who works at the clinic and I thought maybe I would make the cookies for the women who work there and support women in the fight every day. Preheat oven to 350°. Line cupcake pan with liners. Sift flour, cocoa and salt into a bowl. In a large bowl, mix with a hand mixer butter, fruit juice concentrate and vanilla. When well combined, gradually add flour mixture. Dissolve the baking soda in the boiling water and alternate adding eggs and water to the batter mixing well after each addition. Spoon into cupcake cups to ¾ full. Bake until a toothpick inserted comes out clean, about 20 minutes. Be careful not to overbake. Cool completely on rack before frosting. In a small saucepan, heat the Fruit Sweet and honey until warm. Do not boil. Remove from heat, add the chocolate chips and let stand until they melt. Stir and add vanilla and whisk until smooth. Cool for about 20 minutes. Place the whipping cream in a large bowl and whisk in cocoa and whip until soft peaks form. Add the cooled chocolate and beat until stiff. Do not overbeat. Frost the cupcakes and garnish with raspberries and chocolate drops. They are delicious. The whipped cream frosting is so light and tasty. 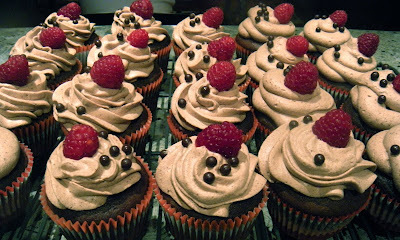 They could use more raspberries, maybe a layer of raspberry jam before the mousse frosting. Any way you make them...just get in there and bake! They Mary Tyler Moore toss! So, I have been cooking up a storm. But not blogging. We hosted a large grad party here and I made pretty much everything (with a lot of help!) We had about 70+ guests and the weather was fabulous! Very proud of Christina and her graduation was a great time. Here's the cookies I made. I'll be back tomorrow with a guest post, and more cookies in the oven! So, what are you waiting for? Get in there and bake! You know the saying, "The cobbler's kids have no shoes". He was too busy with his real customers. We all know a good cobbler would do a little bartering and get his kids shoes. Maybe not custom made for them, but shoes, none the less. My family lives this saying. The food blogger mom, who makes hundreds of cookies, but is sometimes too tired to cook real food, or, gasp, has no sweets in the house for them. What? No rejects? Not one cookie in the freezer, (which holds hundreds), can be given to a sugar craving family member? Well, no. Get over it. I have a million cookbooks, bake something. I admit, I usually have a box of Duncan Hines on hand for these types of melt downs, but I was unarmed when Mr. Sad Face started rummaging (that chaos in the pantry is my order! ), looking for brownie mix. 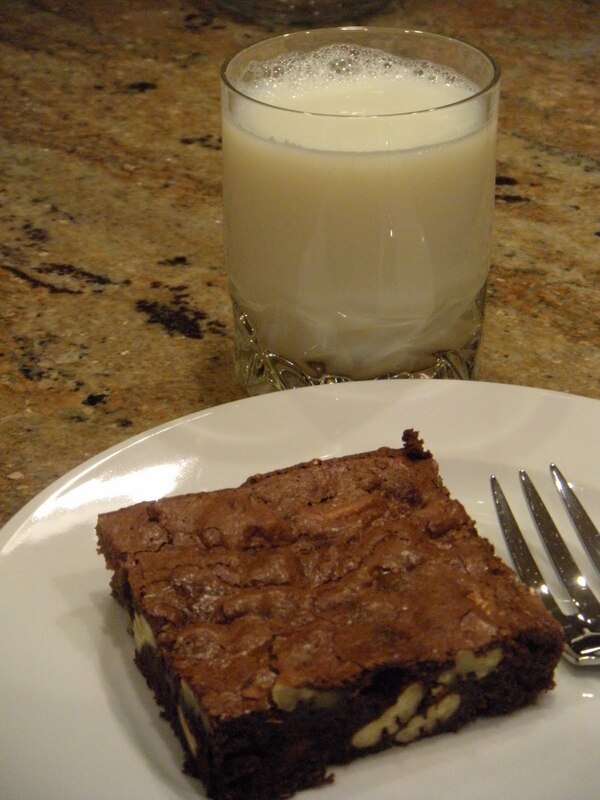 I diverted his man-handling my numerous types of flour, by agreeing to bake him brownies. If there was a Duncan Hines lurking in the pantry, anyone in my family would just bake them up. I usually do a little doctoring, adding sour cream, chocolate chips, nuts whatever is on hand. But I had no easy mix today. So naturally, when I grabbed the box of Guittard Semisweet Chocolate Wafers, I knew I would never actually follow their recipe on the back of the box. If I baked the Guittard brownie recipe with orange zest, cranberries and almonds, I would be a happy baker. My family would feel betrayed. There are a few things I am not allowed to "fancy up". There are links to some of my favorite ingredients that you may not be familiar with, things I like to use and write about. So here's what I did. Preheat oven to 325° (I set to 315° because I use convection). Spray a 9X13 pan. Heat chocolate, butter and buttermilk in double boiler until melted and well mixed. Remove from heat and set aside. In a mixing bowl, beat the eggs and sugar until pale and thick. Add vanilla paste, Trablit and salt. Mix and add melted chocolate and mix thoroughly. Add the flour and mix until combined. Mix in pecans and put into prepared pan and bake about 25-30 minutes. The top will be shiny with a thin crust on it. The soft center will solidify as it cools. Whatever you do, do not over bake these. What a waste of a pound of chocolate that would be! Cool a good 2 hours before cutting. They are delicious cold! You can look at it this way. The cobbler uses only the finest materials (ingredients) for his paying customers to maintain his high standards. So when he breaks down and makes those shoes for his kids(brownies in my case) he uses those top-shelf ingredients. Just so they know, they may feel like they are not the number one priority, but in fact they are the reason for everything we do, including just breathing. So, what are you waiting for? Get in there and bake. I can proudly say I am a very handy girl to have around. Being the last of 5 kids, and a full 7 years after the rest of them (I was an afterthought) my dad took full advantage of having me around. I was no replacement for a son, but I built a sauna with him, mowed the lawn (not without a little bitching mind you) and worked in the garden. As I got older, I would call home and ask my mom if I could speak to the plumber, electrician, carpenter or butcher, depending on what sort of dilemma I was in. Sirloin or toilet flapper, he could answer just about any question. His favorite answer is "jiggle the jiggler", I guess my toilets run a lot. When I was in college and I sheared off the thermostat in my apartment carrying furniture down the hall, he and my brother-in-law talked me through putting in a new one. A thermostat! That's a big project for a college girl! So now life is a little crazier, I still call my consultant for help, especially in the meat case, but when I have a big project to do around here now, I call Big Jim. Who, by the way, is not big at all, he is skinny, and feeding him gives me great satisfaction. Now he doesn't do anything that I can do myself. No dimmer switches or light fixtures, no painting or minor repairs. Big Jim puts in gas lines, moves cabinets, does plumbing and guts and retiles my shower. He is the most meticulous person I have ever met, and that is a good thing. My tiles are perfectly plumbed, my gas line was dropped in with precision, and there isn't a drip or leak anywhere. I think he kinda likes my family. When my son told him about a death threat he received by a very sketch employee where he worked, Big Jim was a little riled about it. He would help us out in a crisis no doubt. So we are in the middle of the master bath remodel. I won't get into details, but let's just say I am very ready to have a shower in my own bathroom. Big Jim has a lot going on right now, and everyone thinks their job is more important than the other. (Who? Me?) So last week was his birthday. He has walked past hundreds of sugar cookies on my dining room table in the past months. I have given him a reject or two and I made a few Easter cookies for him. 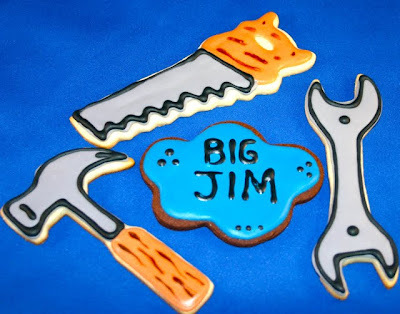 But for Big Jim's belated birthday, he got cookies only a handyman could appreciate. Or earn! So happy birthday Big Jim and thanks for the great job you do for us! So, it appears the cookies from the mini Memphis premiere were a hit. 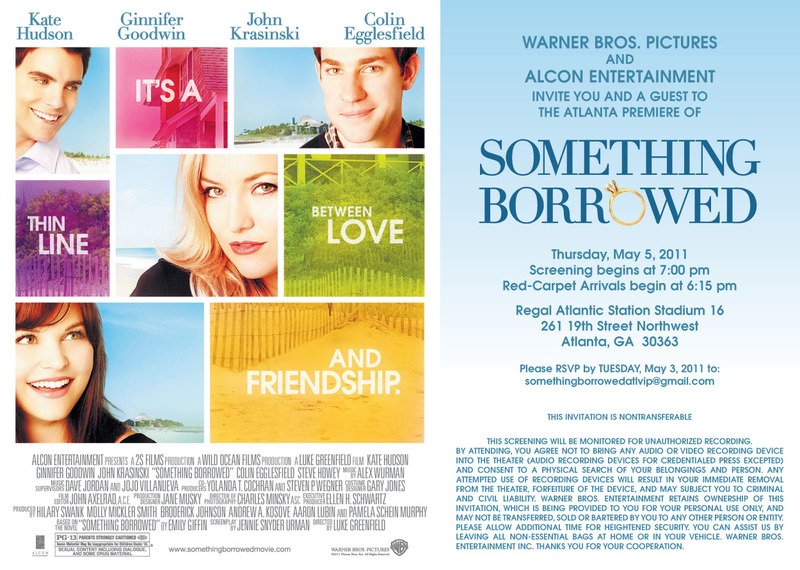 I recieved a comment on my blog from the first Something Borrowed and was invited to make cookies for the Atlanta premiere which was hosted by the author Emily Giffin. Having made 200 of these cookies already, I had a pretty good idea how to tackle them the second time around. I can honestly say I shaved off a good 4 to 5 hours (yea, these were no easy task) and they improved greatly! Isn't every task all about learning and improving?! So shipping 200 cookies would not be an easy feat, so I decided to drive them there myself! I used to live in Atlanta, and although I would have to make a quick 2 day trip, I knew I would see my oldest friend, make a trip to Nordstroms, perhaps a lunch out and the movie Something Borrowed the night before it opened. The trip was pretty uneventful until I hit Birmingham. I crested a hill and noticed traffic was crawling. 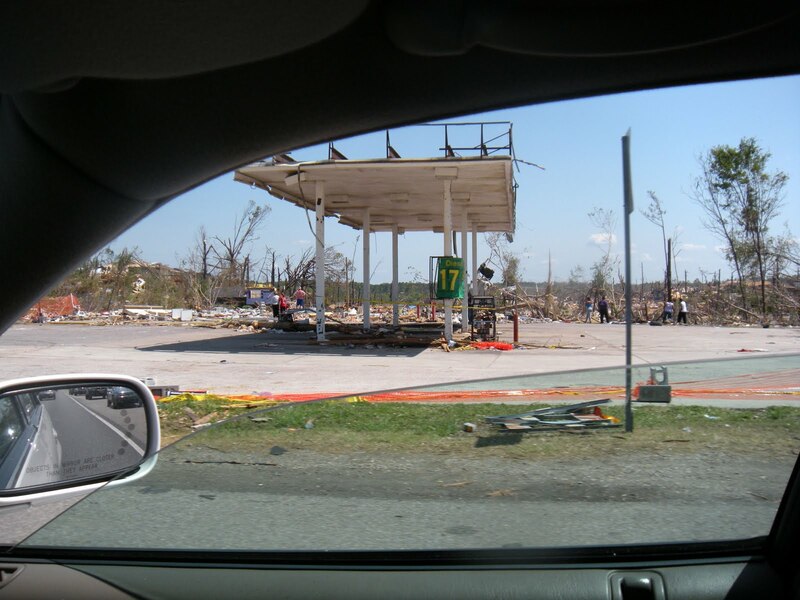 The recent tornados had swept right across Highway 78 and took everything with it. Yes, I shot a picture while driving, but honest, it was like 5mph. I am no stranger to tornados. We had massive destruction in Clinton, IA when I was a little kid, my sister in Waterloo, IA has lost 2 houses in the same spot to tornados fairly recent, you can see a photo in this post and the neighborhood I now live in was decimated about 17 years ago on Thanksgiving weekend. We came house hunting a week later and were amazed at the power of that storm. But the Birmingham devastation was truly tragic, and to drive right through it, it was a little surreal. The author had a great turn out to the premiere, and apparently when she sent out her invites, there was some sort of a note that asked them to wear pink. Being a guest of the assistant, I showed up in black...oops. That's okay, I didn't stick out too bad! The movie was terrific, and I have since seen it again. If you read the book, you will not be disappointed. The characters are a great fit to the book, and the few changes they made to the story just keep it moving along. If you haven't read the book, the ending will be a bit of a shock. No spoilers here though, I encourage you to see it. My family hates going to the movies with me, having studied film in college (yep, they actually offer degrees in such things, see what it is doing for me!) I do not watch a movie like most people. I look everywhere on screen, except, it seems, where everyone else is looking. I am always looking at product placement, Williams Sonoma kitchen stuff, Pottery Barn accessories, what books are on the coffee table, cookbook titles, you get the idea. Before the movie, the producer Molly Smith and the author Emily Giffin spoke about the film, and when the credits rolled on the front end the audience cheered when their names came up, and I missed it looking elsewhere! I also caught a jump cut (oops, they're pretty common, most people don't see them) and I loved the FedEx reveal shot towards the end when she returns and "he" is there. The producer is related to FedEx, so that is something only a Memphian would understand! The funniest scene is a cameo by the author, she is sitting on a park bench reading her book (clever), and the characters are having a very off color conversation. It is a great scene! So all in all the trip was fabulous, my friends are great, the movie rocked. Now, back to reality! Who knows what's next....but for now, get in there and bake! I really do try to not repeat blogs. But it's Mother's Day, and my blog on my Mom bears repeating. She is coming for Christina's graduation in a couple of weeks, so I will dote on her, spoil her with sweets, and take her to Chicos and Coldwater Creek. After all, what can a grown woman buy her Mom for Mother's Day? Flowers? Perfume? Candy? Well if you thought of any of those, you don't know Jo very well. Jo, as I affectionately call my Mom, just isn't the average mom. She specifically requested no gifts for Mother's Day. She knows that I will likely oblige after the crazy 1,000 miles in 3 days I had. But she also knows that this blog is more my idea of a Mother's Day card. In 1992 my Mom must have gotten tired of handwriting the family recipes every time one of us misplaced one. For Christmas that year she gave us all a cookbook called The Kitchen on Market Street. The kitchen in the big old house on the corner of 10th and Market is the setting for this book. This is where my Mom grew up and how she paid tribute to her Mom, but unfortunately Grandma was no longer with us. The book is filled with recipes and stories from her childhood and even from motherhood. So I have decided to honor my Mom, my Grandma and my heritage. I bounced the idea off my sisters, and they are in. Guess what Jo? We are writing our own cookbook as a tribute to you, as a way to document these memories and pass them on to our kids someday. I had hoped when I first published this in 2009 that I would be published and on every bookshelf in America with my cook book. But the truth is, I have started it, and it is very difficult to write a cook book. I am the classic "throw together" chef. I can make a family recipe and then it dawns on me that I didn't measure anything and never set a timer. Wouldn't that make an interesting book? But I am plugging away. I know that eventually my Mom's little notes, cards and letters will find their way into the pages of this book as well. Happy Mother's Day!